Now we all can watch TV live on our computer. what about a situation like you stay in hostel and you don’t have TV but you have internet connection and its your favorite team match you just don’t want to miss it nor want to see boring ticker here is solution you can watch TV on your computer without installing any external or internal hardware. just directly in your media player through your broadband connection in just few easy steps. i would just love sharing with you all about some free ware programmed through which we can watch TV live on our computers. this includes all major European football leagues,espn ,wrestling and some our favorite TV stations mtv.and many more. Start the media player, make sure you use the latest version. Right-Click and select Options from the menu. Click on Performance and Change the Buffer Size of Content to 30 seconds. In real player you select Tools -> Preferences and click on the General -> Playback Settings. The setting Buffer up to 30 seconds is at the bottom of this window. Sometimes you need to start streams manually. Use the stream formats information to figure out the program to use. Download from the above link, unzip, start. A channel list will be displayed. Double-click a channel and windows media player should start and begin buffering and displaying. Download from the above location. This one has an installation script that is unfortunately producing lots of gibberish. The buttons are designed like in every other windows installation script. (left button, choose a directory, 3x middle button). 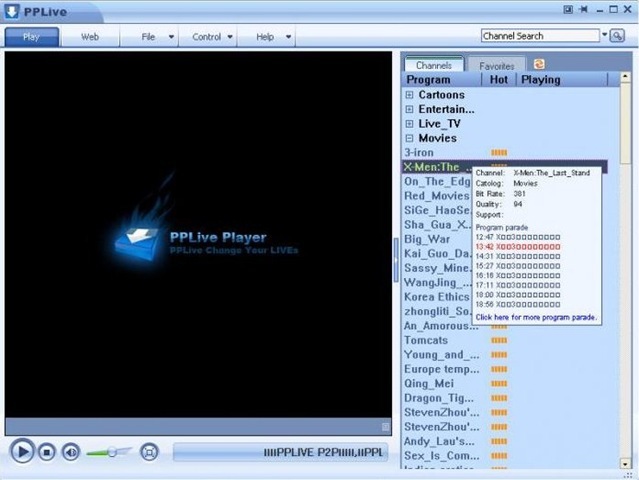 The Channel list is on the left, you see the channel name, the quality of the stream in Kb per second and the users connected to the channel. Just download and run the installation script on pplive. Its all in English, no need to worry. You need the pplive channel list for it, it does not come with a loaded list.